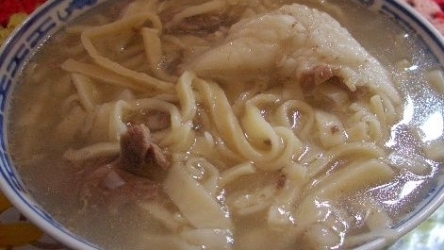 Guriltai Shul is a Mongolian food recipe for mutton soup served with egg noodles. Heat the oil in a large wok and quickly brown the meat. Add stock and simmer, covered, until meat is almost tender, about 20 minutes. Add vegetables and simmer until almost done, about 20 minutes. Add noodles and salt and continue simmering until noodles are ready, about 10 minutes.